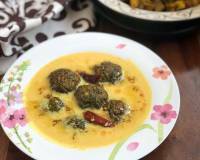 Punjabi Methi Kadhi is a traditional Punjabi Kadhi with the flavour of methi. 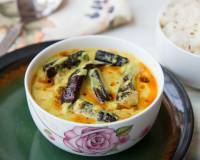 It is served along with Steamed rice which is also known as Kadhi Chawal. 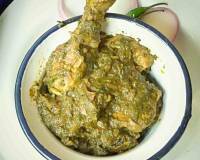 You can also serve it along with Bharva Bhindi, Steamed Rice and Phulka for an everyday meal. 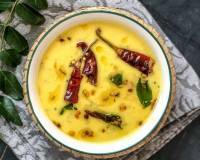 The Traditional Punjabi Kadhi Recipe, is a yogurt based tangy and spicy curry that is a staple dish in North India. 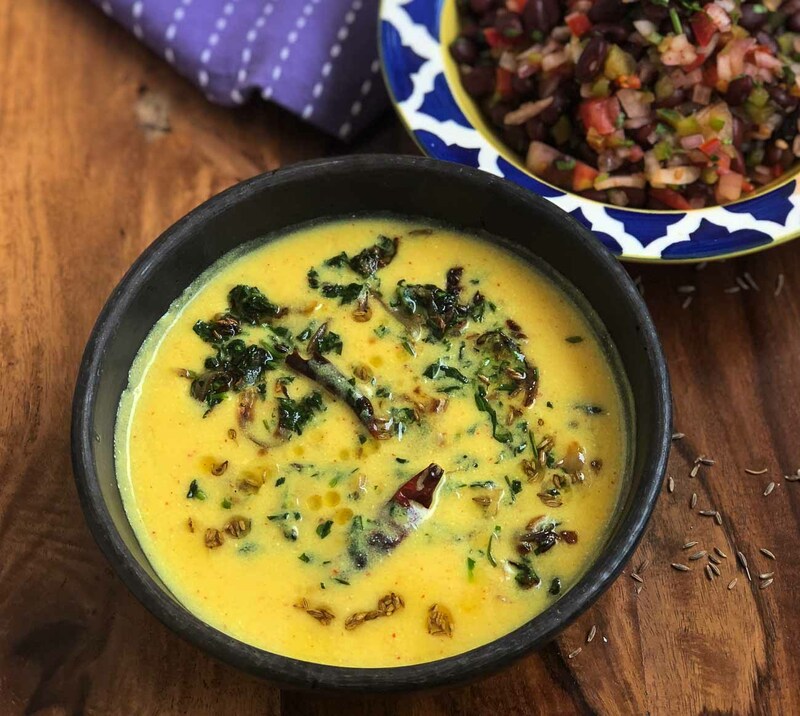 You can make this kadhi plain or add fresh methi leaves or spinach leaves, to add to the flavor and nutrition of the Punjabi Methi Kadhi. The subtle bitterness of fenugreek is balanced with the sourness of yogurt, to create a dish that is healthy and delicious at the same time. 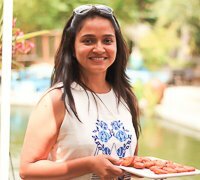 Serve Punjabi Methi Kadhi along with Bharva Bhindi, Steamed Rice and Phulka for an everyday meal. 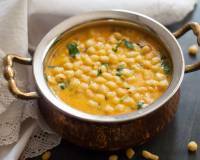 To begin making the Punjabi Methi Kadhi Recipe, we will first start by combining all the main ingredients into a large sauce pan including gram flour, curd, turmeric powder, coriander powder, red chilli powder and salt. Add 2 cups of water and whisk it all together, until it forms a smooth paste without lumps. Place the saucepan on medium heat and bring the Kadhi mixture to a boil. While the kadhi is boiling, keep whisking it continuously, so it becomes smooth. Continue to whisk it until you notice it has begun to thicken and the kadhi is smooth. Turn the heat to low at this stage and allow the kadhi to simmer while we get the remaining ingredients ready. We will next a teaspoon of oil in a small pan; add in the onions and saute the onions on medium heat until the onions turn slightly brown and are tender. Once tender, add in the methi leaves and saute until it wilts. The methi leaves, quick very quickly, so once it is wilted, turn off the heat. Add this onion and methi mixture to the simmering Punjabi Kadhi. 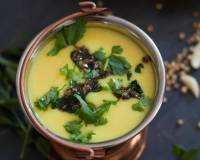 Turn the heat of the Methi Kadhi to medium high, so it comes to a brisk boil. Allow the kadhi to boil stirring occasionally for about 5 to 7 minutes. Heat ghee in a saucepan over medium and add in the mustard seeds and cumin seeds and allow them to crackle. When they begin to crackle, add in the red chillies and stir fry until the red chillies are well roasted. Pour the seasoning over the in the boiling Punjabi Methi Kadhi. Give it a stir, check for salt and spices and adjust to suit your taste. 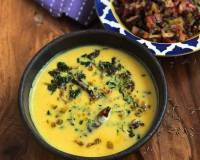 Once done, transfer the Methi Kadhi to a serving bowl and serve hot.